Revered for the particular way he wields recycled wood, Japanese craftsman Haroshi brings his talents stateside with his third solo show at Jonathan LeVine Gallery in New York City. Fans of Haroshi’s style will be particularly excited to hear that the artist is expanding on the motifs expressed in previous works; for Still Pushing Despite The Odds, Haroshi focused on various found objects of the early and mid-20th century – neon signs, roller skates, toy horses, dental tools and more – iterating the objects in gloriously disparate ply colors to evoke the connection between plaything and person. The artist achieves this by virtue of the material, as skateboards were the impetus for this train of thought. 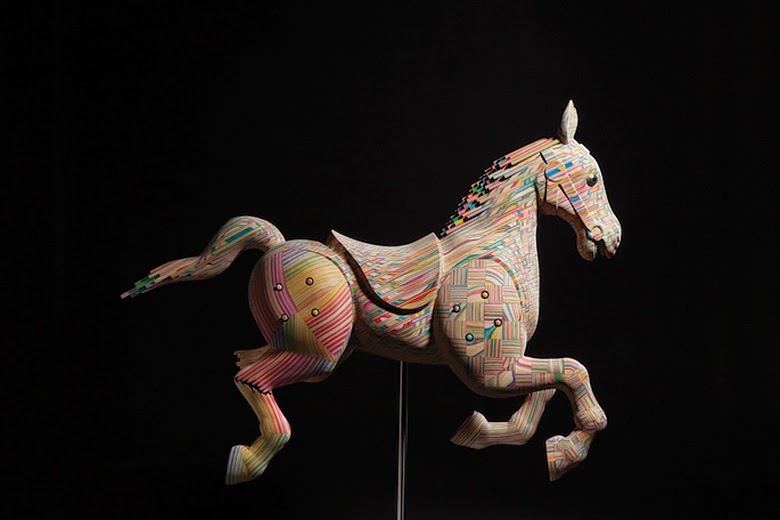 A neat take on our everyday toys, be sure to stop by Jonathan LeVine Gallery if in the New York area. Still Pushing Despite The Odds runs from February 19 through March 21.